With Qantas, you’ll discover warm Aussie hospitality from the moment you step onboard, shaped by almost 100 years of flying. Whether you're flying to Queensland to take a dive into the Great Barrier Reef, or heading to the Northern Territory to see Uluru and its russet-hued surrounds, your dream holiday begins here. 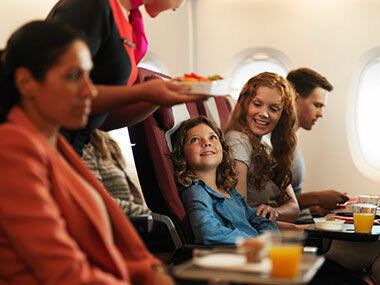 Qantas believes the journey should be as memorable as the destination. 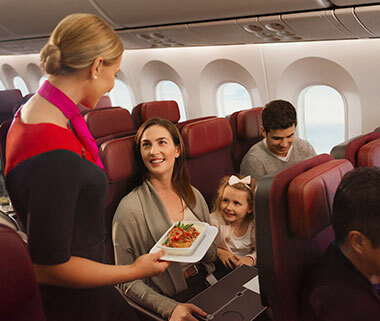 With friendly service, spacious cabins, delicious cuisine, self-service snack bars for round-the-clock refreshments, and thousands of hours of in-flight entertainment – from take-off to landing – you’ll enjoy an unparalleled travel experience with Qantas, the Spirit of Australia. Call our Travel Experts now on 0800 587 0058 to find out more, or visit them in store to book. Prepare to fly in comfort and style on a Qantas international Economy flight, with cabins boasting ergonomically designed slimline seating with built-in lumbar support, adjustable headrests, plenty of recline and an innovative footnet rest. Facilities differ between specific aircrafts, however the majority of Qantas international Economy seats boast a standard 31-inch pitch and a width of 17 inches. 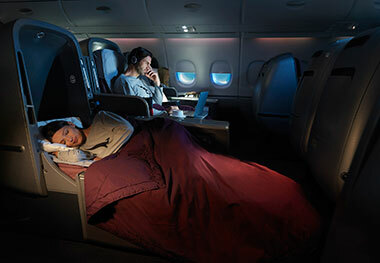 The new Qantas Dreamliner offers even more space, as well as more comfortable, ergonomically designed seating. Regardless of aircraft, each Qantas flight is about delivering a friendly and helpful service within a comfortable and restful environment. Whichever cabin you choose, when it’s time to relax onboard you can sit back and choose from over 1,500 hours of movies, TV boxsets and games options on your personal in-flight entertainment system. Choose from a selection of three meals in-flight and help yourself at the self-service snack bar. You’ll be served a bespoke Bickford's welcome drink after take-off, as well as great snacks throughout the flight. 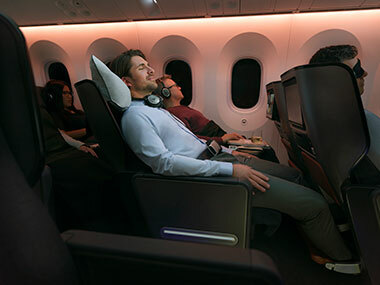 Now a standard feature on many long-haul international flights, Qantas' award-winning Premium Economy provides a mid-range alternative between Economy and Business Class. On the A380, this exclusive upper deck cabin has just 35 seats, each designed by Marc Newson with ergonomics in mind. Seats boast a pitch of up to 42 inches and a width of up to 19.5 inches, as well as adjustable foot and headrests and a convenient centre console that allows you to stretch out and relax en route. Onboard the Qantas Dreamliner, passengers will enjoy a 28-seat private cabin, in a 2-3-2 configuration, with a 38-inch seat pitch and up to 22.8 inches of width. Premium Economy guests not only have more space (9-9.5 inches of recline), but they also have devoted flights attendants, serving up a more personalised service in an elite environment. Relax as soon as you're on board with a complimentary sparkling wine or beverage. During your flight you'll be able to enjoy a contemporary menu inspired by leading Australian restaurateur Neil Perry, all served on stylish Marc Newson-designed tableware. We offer a selection of premium Australian wines that match our menu. You also have access to a selection of snacks and drinks, as part of our continuous refreshment service and self-serve bars. Nothing beats being able to lie back and catch up on some much-needed sleep. That’s exactly what you can do on a Qantas Business Class flight. Onboard the A380 you will find a dedicated upper deck, 64-seat cabin with your own fully-flat Skybed and bundles of storage space. You can shift your seat (or rather, bed) into a position that suits you before testing out its unique massage settings, turning on the entertainment system or snuggling down with nothing but the reading light and a good book. Your private Skybed boasts a 80-inch seat pitch, reclining fully to almost two metres in length. 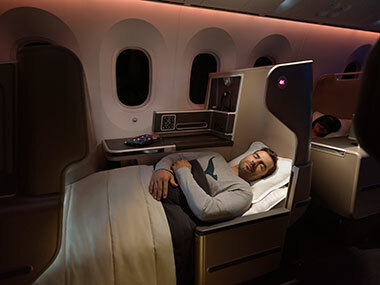 And that's not all: Qantas' new sleep service will offer you a mattress, duvet for extra comfort, Peter Morrissey-designed pyjamas and a special T2 wellbeing tea blend designed to promote a soothing, deep sleep. And then there's the Dreamliner Business, where you'll benefit from direct aisle access from every one of the 45 Business suites. Set in a 1-2-1 configration, the seats are ergonomically designed with a 46-inch seat pitch, 80-inch bed/seat length and up to 25 inches of width, offering greater personal space and more privacy. When travelling on eligible Qantas flights, you'll also be able to take advantage of Qantas Chaffeur Drive, meaning you'll be collected in a luxury vehicle and driven to the airport to meet your flight. On arrival at your destination, you will also be met and driven to your hotel, office or home. Working with famed Australians, Qantas also offers guests a Neil Perry-designed menu complemented by multi award-winning wines. Dining options are flexible, including on-demand supper service and room service-style breakfast, all presented on premium tableware. With Select on Q-Eat you can choose your meal and when you'd like to eat it before you even board. There will even be onboard 'Sommeliers in the Sky' to advise you on the best wines to pair with your meal. 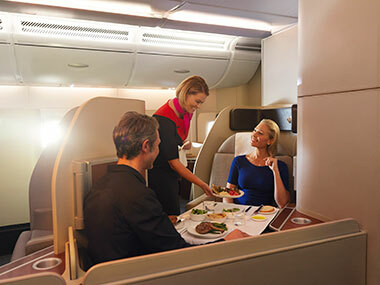 First Class cabins on Qantas A380 international flights are all about unsurpassed luxury. Experience a new level of in-flight comfort as you relax in your own private world – specifically one of only 14 First suites. Stretch out in your fully flat, extra-wide bed and take advantage of our Bedding Down service, which features luxurious pillows, blankets, a duvet and mattress. Qantas First Class amenity kits contain skincare products, toiletries, a hairbrush or comb and an eye mask. You will also be presented with a soft and luxurious set of pyjama and slippers. Use your personal suite controller to move your seat, leg rest and lumbar positioning from a relaxed reading position, to a fully-flat bed of up to 212cm in length. Your space also features an ottoman so you can accommodate more than one passenger in your suite. When travelling on eligible Qantas flights, you can also experience the convenience of Qantas Chauffeur Drive: be collected in a luxury vehicle and driven to the airport to meet your flight. On arrival at your destination, you will also be met and driven to your hotel, office or home. Benefit from a dedicated First Class check-in counter and boarding lane too, before relaxing in the First or Business lounge. All meals are designed by Neil Perry, prepared onboard and made to order with the finest ingredients. Consult one of our 'Sommeliers in the Sky' on selected flights, who'll advise you on our selection of award-winning wines to match your meal. Snacks, canapés and light meals are also offered, as well as standard beverages and freshly-made coffees. Feeling super luxurious? Guests are welcome to dine a la carte or enjoy an eight-course tasting menu with a friend. Qantas International passengers travelling in Economy Class are permitted to bring up to 7kg of carry-on baggage on board, consisting of one small bag and a briefcase or non-rigid garment bag. First Class, Business Class and Premium Economy passengers can carry two bags each weighing a total of 7kg on board, as well as an additional small bag or non-rigid garment bag. Take fragile or valuable items in your carry-on to safeguard against loss or damage. Qantas checked baggage allowances vary according to destination and cabin class. Qantas International passengers travelling to The Americas in Economy Class and Premium Economy are permitted to check two pieces of baggage each weighing a maximum of 23kgs. Passengers flying in Business Class or First Class can check three pieces of baggage each weighing a maximum of 32kgs. Qantas Club members, Silver and Gold Qantas Frequent Flyers, as well as Platinum and Platinum One Qantas Frequent Flyers can check one additional piece of baggage, depending on their cabin class. Qantas International passengers travelling to all other destinations in Economy Class can check up to 30kg of baggage in total. Passengers travelling in Premium Economy and Business Class are permitted to check up to 40kg of baggage in total. Passengers travelling in First Class are permitted to check up to 50kg of baggage in total. Extra weight allowances, increasing in 10kg increments, are offered to Qantas Club members and Silver Qantas Frequent Flyers, Gold Qantas Frequent Flyers and Platinum/Platinum One Qantas Frequent Flyers across the various cabin classes. If you feel your checked baggage exceeds the weight limits, purchase additional baggage online in advance to avoid excess fees at the airport. All sporting equipment and other bulky items must be included in your checked baggage allowance, subject to requirements. Heavy items such as bicycles, skis and snowboards, fishing equipment, golf clubs, scuba diving equipment and surfboards must be securely packed and must not exceed maximum size and weight limits. Bicycles must be packed in a protective bike box, available from Australian Qantas Terminals and retail bike stores. Passenger-supplied bike boxes must not exceed specified weight and size dimensions. Surfboards may be taken as checked baggage provided the fins are removed and the boards are in a secure protective bag. Adult passengers accompanying infants may travel with a collapsible stroller or pushchair, collapsible cot or bassinet, car seat or baby capsule to be stored as checked baggage in the aircraft’s hold, with carry-on and checked baggage allowances generally the same for adults and children. In-flight amenities include baby, toddler and child meals, as well as pre-flight use of strollers once you have checked your personal stroller in. Extra food and nappies for infants may be taken on board in addition to your carry-on limit. Dangerous goods which may endanger the safety of passengers are strictly regulated for carriage on Qantas aircraft. Dangerous goods include hazardous materials such as flammable liquids, gas cylinders, explosives and incendiary devices such as flares and fireworks, corrosive materials, bleaches and peroxides. Restrictions are also applied on the types of goods permitted into aircraft cabins, with the carriage of aerosols, toiletries and alcohol strictly regulated. Exemptions are applicable to certain medicines and baby products. Refer to the Australian Government Liquids, Aerosols and Gel Guide for more information on carry-on baggage restrictions. Wheelchairs and electric mobility aids are able to be taken on the aircraft with prior approval from Qantas. Web check-in is available up to two hours before departure, with the online check-in window conveniently opening some 24 hours before your flight. Web check-ins allow you to print your boarding pass at home, while baggage must be checked a minimum of 90 minutes prior to departure. Mobile check-in is available with the Qantas app. Passengers who download the app will be able to check-in with a few simple taps, access their digital boarding pass, select their seat, receive real-time gate and baggage information, and so much more. Airport check-in is available up to 90 minutes before departure for Economy and Premium Economy passengers and up to an hour before departure for passengers travelling in Business and First Class. Dedicated check-in areas and fast-track immigration facilities are also offered to Business and First Class passengers, while self-service check-in kiosks operate at London’s Heathrow Airport. 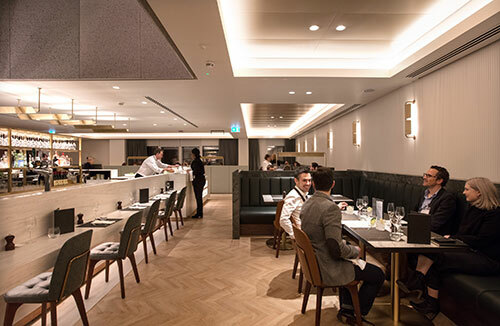 Qantas’ newest addition to its range of lounges opened at Heathrow’s Terminal 3 in November 2017, and is open to eligible Business and First customers, Qantas Frequent Flyers, oneworld Emerald and Sapphire members and partner airline members, including BA Executive Club and Emirates Skywards travellers. The Qantas Frequent Flyer program provides more than just the chance to redeem points towards flights, with a wide range of membership benefits on offer. Qantas operates four memberships tiers and you can start earning points towards your status the minute you start flying. Bronze is Qantas’ entry-level membership tier, allowing you to earn points in the air and on the ground at one of the more than 450 commercial partners linked to the program. These include car rental companies, hotels, and the Woolworths group. Silver membership is automatically calculated when guests accrue 300 "status credits" over four Qantas or Jetstar-affiliated flights. Silver tier membership benefits include priority check-in, extra baggage allowance, priority baggage handling and one Qantas Lounge pass per year. To be upgraded to Qantas Frequent Flyer's Gold membership, flyers must clock up 700 status credits over four Qantas or Jetstar-affiliated flights. 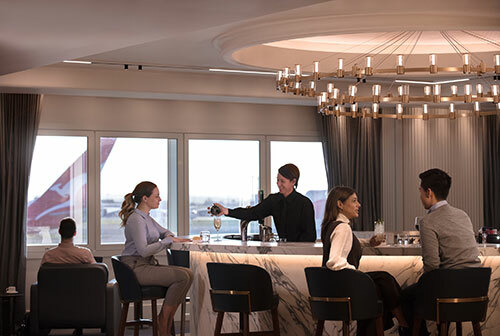 Additional membership benefits on top of those already earned in Silver status include complimentary membership to the Qantas Club and access to partner lounges across the globe. Gold members are also granted access to shorter security lanes and express customs and immigration clearance. 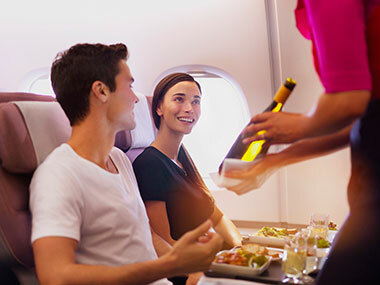 Qantas' premium Frequent Flyer tier Platinum is awarded when passengers accrue 1,400 status credits over four Qantas or Jetstar-affiliated flights. On top of the benefits already in place for Silver and Gold memberships, Platinum Frequent Flyers gain access to the prestigious First Class lounges, use of superior lounge amenities, priority service at every step of your journey and privileges with partner airlines.